With the summer vacation season just starting, museums in Seoul are gearing up to attract young visitors and their parents to a variety of programs. 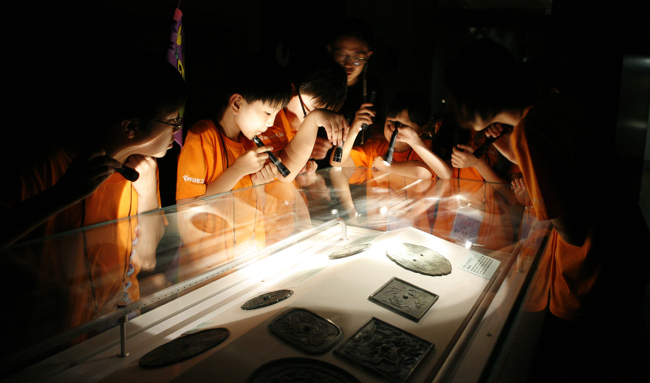 During the overnight program “One Night and Two Days,” the NMK will take elementary school children between 10 and 13 to view sections of the museum such as the conservation and science department and the permanent exhibitions that have on display more than 12,000 artifacts dating from the prehistoric time to Joseon era (1392-1910). Children will sleep in their own sleeping bags at the museum and take a morning stroll around the beautiful museum garden. They will also visit the ongoing exhibition “Treasures from Afghanistan“ after breakfast. The overnight museum stay will run from Aug. 4-5. For more information, visit http://www.museum.go.kr/site/child/home. The MMCA’s children museum in Gwacheon will offer programs from Aug. 2-28 to help young students better understand contemporary art. Some 30 children between 8 and 13 and their fathers will be allowed to camp in the outdoor sculpture park and engage in activities, including making ice sculptures. 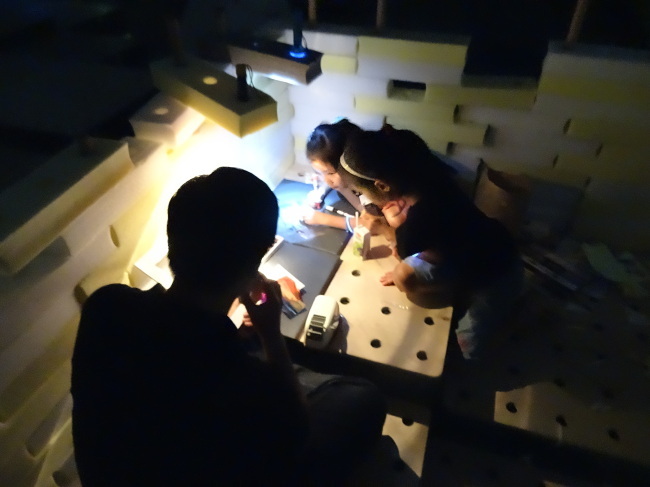 They are also given art-related tasks that will require them to navigate the museum at night. The “Edu-Night” program runs Aug. 6 and Aug. 13. Photographer Kang Hong-gu, whose photographs depicting traces of the fast urban transformation of Korean cities went on exhibit at the MMCA Gwancheon Museum last year, will hold an artist talk on Aug. 7, 14 and 21. Kang will explain his creative processes and works to children over 6. Children will also learn about those who work in museums through lectures offered by museum staff members such as conservators, archivists and educators. They will introduce their jobs to the young audiences. The MMCA’s Seoul museum will open until 9 p.m. from Wednesday to Saturday until Aug. 27. Admission will be free for visitors entering the museum between 6 p.m. to 9 p.m. 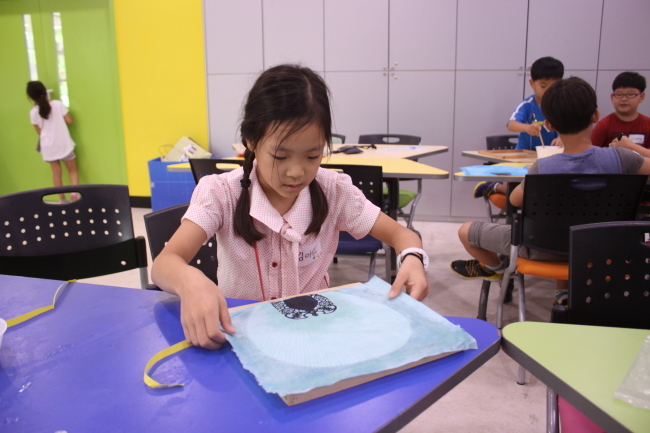 The Seoul branch will run children programs related to current exhibitions until Aug. 27, including those about the emergence of technology and science in art. The Bit.Light workshop on Aug. 3 and Aug. 10 will invite children and artists to an interactive class that will involve creation, viewing and playing with elements of new media and art. A part of the underground floor of the museum will transform into a meditation zone, inviting visitors to cool off in the summer heat and spare a moment to meditate amid the hectic pace of urban life. For more information and registration, visit www.mmca.go.kr. The National Folk Museum of Korea is also running hands-on craft and folk-art-making activities for children and teenagers until Aug. 19. Children will be able to trace Korea’s old practices to keep cool in the summer heat such as by attaching Korean mulberry paper to door or window frames to allow wind to come through. To enhance understanding in other cultures, there will be multiculturalism sessions in which children will be able to try the folk games and instruments of other countries such as China, Vietnam and Indonesia, on Aug. 5, 10 and 11. For more information, visit www.nfm.go.kr.